How fabulous is this little sign spotted at Frazzleberries on Newport’s lower Thames Street?? They have the best signs, mostly tailored to the Newport lifestyle (Gone to Hazard’s, Gone to Bailey’s, Gooseberry Beach, If You’re Lucky Enough to Live in Newport, You’re Lucky Enough, Red Sox Fan, Just Married in Newport, etc.) plus owner Jerry and Katie can custom create signs with weddings dates, personal monograms etc. Love it! 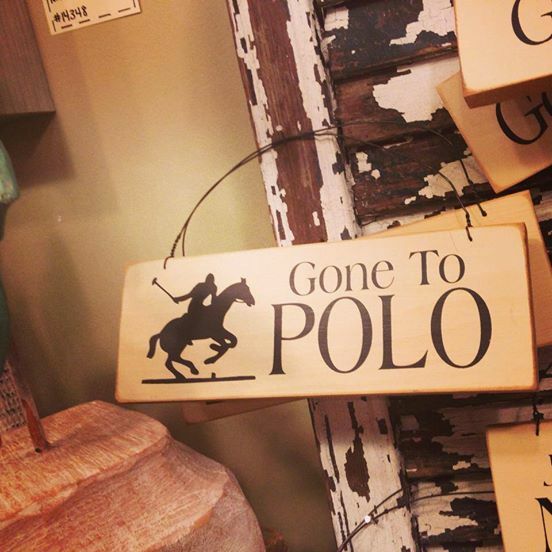 Speaking of polo, we’re entering what might just be the best time of the year to catch Newport’s polo ponies. Now in it’s 23rd season, the Newport International Polo Series continues Saturday afternoons, starting at 4pm. Today, after the match versus Singapore, stick around for the Veuve Clicquot Champagne Toast & Trophy Presentation and witness the art of sabrage. Weilding a replica Napoleonic sword, the sabrage demonstration will be under the direction of former Moet Hennessy expert Jeffrey Pogash (he now is a consultant for Rhode Island’s own Cocktail Guru. Raise a glass to the competitors, and the winner, with a festive toast. Veuve Clicquot is available by the glass or by the bottle from the fieldside Twisted Pony Bar. Cheers! Entry filed under: Uncategorized. Tags: custom signs, Frazzleberries, Frazzleberries newport ri, frazzleberries warwick, newport international polo ri, newport polo portsmouth, Newport polo ri, Polo signs.